Abstract. Volcanic aerosols exert the most important natural radiative forcing of the last millennium. State-of-the-art paleoclimate simulations of this interval are typically forced with diverse spatial patterns of volcanic forcing, leading to different responses in tropical hydroclimate. Recently, theoretical considerations relating the intertropical convergence zone (ITCZ) position to the demands of global energy balance have emerged in the literature, allowing for a connection to be made between the paleoclimate simulations and recent developments in the understanding of ITCZ dynamics. These energetic considerations aid in explaining the well-known historical, paleoclimatic, and modeling evidence that the ITCZ migrates away from the hemisphere that is energetically deficient in response to asymmetric forcing. Here we use two separate general circulation model (GCM) suites of experiments for the last millennium to relate the ITCZ position to asymmetries in prescribed volcanic sulfate aerosols in the stratosphere and related asymmetric radiative forcing. 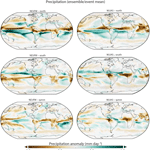 We discuss the ITCZ shift in the context of atmospheric energetics and discuss the ramifications of transient ITCZ migrations for other sensitive indicators of changes in the tropical hydrologic cycle, including global streamflow. For the first time, we also offer insight into the large-scale fingerprint of water isotopologues in precipitation (δ18Op) in response to asymmetries in radiative forcing. The ITCZ shifts away from the hemisphere with greater volcanic forcing. Since the isotopic composition of precipitation in the ITCZ is relatively depleted compared to areas outside this zone, this meridional precipitation migration results in a large-scale enrichment (depletion) in the isotopic composition of tropical precipitation in regions the ITCZ moves away from (toward). Our results highlight the need for careful consideration of the spatial structure of volcanic forcing for interpreting volcanic signals in proxy records and therefore in evaluating the skill of Common Era climate model output. How to cite: Colose, C. M., LeGrande, A. N., and Vuille, M.: Hemispherically asymmetric volcanic forcing of tropical hydroclimate during the last millennium, Earth Syst. Dynam., 7, 681-696, https://doi.org/10.5194/esd-7-681-2016, 2016. 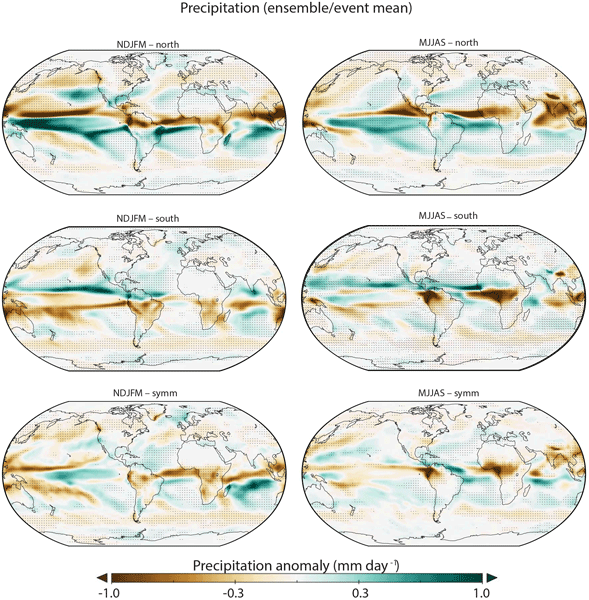 A band of intense rainfall exists near the equator known as the intertropical convergence zone, which can migrate in response to climate forcings. Here, we assess such migration in response to volcanic eruptions of varying spatial structure (Northern Hemisphere, Southern Hemisphere, or an eruption fairly symmetric about the equator). We do this using model simulations of the last millennium and link results to energetic constraints and the imprint eruptions may leave behind in past records.